Charleston is a wonderful town to visit. With many of its old buildings still preserved, Charleston is a historical town that was the site of many important civil war events. There are plenty of things to do and see around the city too, including swamp and plantation tours. One can go and visit many of the old mansions, take carriage rides, visit local markets and even do some up-scale shopping downtown. 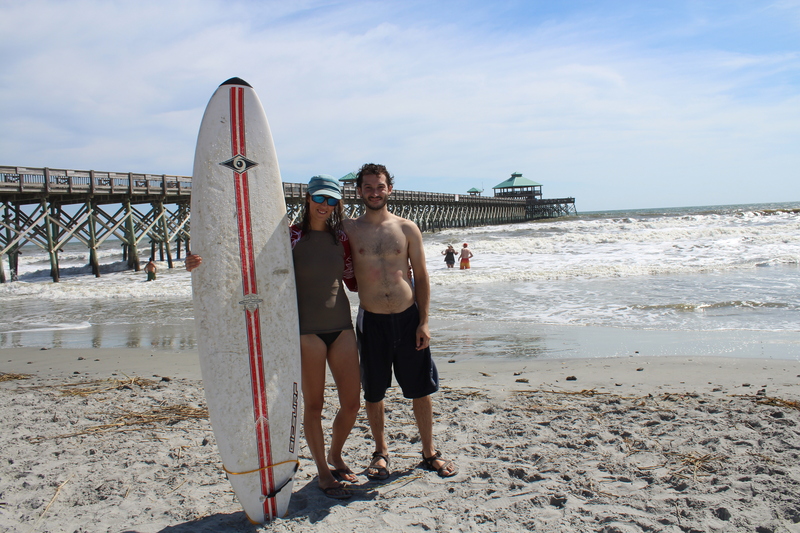 John and I even headed to nearby Foley Beach for some surfing! 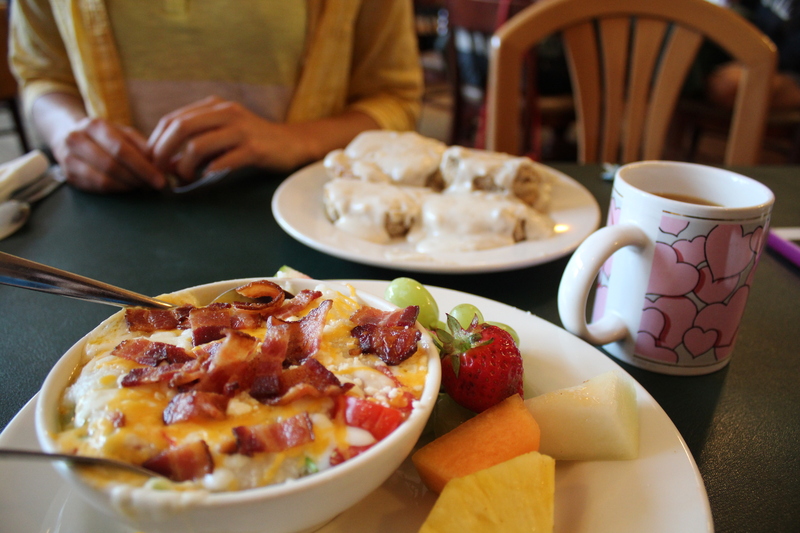 But of course, the highlight of Charleston had to be the food! Brace yourself – you’ll be looking at some delicious food for the next few minutes of your life! In 1989, hurricane Hugo hit Charleston and did considerable damage to the city. Charleston needed a reason to convince investors that the town was worth re-building, and a historical downtown full of restaurants was the key. Today, downtown Charleston is a happening place, with food and restaurants as the centerpiece. John and I learned this all when we did a culinary tour of Charleston. During this tour we went around town learning about the history of southern cuisine while sampling many of the local favourites: grits, hush puppies, fried green tomatoes, red pepper relish, pulled pork, corn bread, biscuits, collard greens and of course the sweet and wonderful praline. As we went around town, we learned about all of the different culinary influences on southern cuisine, including the British, French and Africans. Fun fact: We learned that when servants would take the dinner from the kitchen house to the main dining room (typically in separate buildings), they would often be harassed by dogs. To alleviate this problem, they would throw corn bread at the dogs to distract them. Eventually, they deep fried the corn bread and these became “hush puppies.” Kinda funny, eh? The food didn’t stop at the culinary tour. John enjoyed a variety of treats on his birthday, including Captain Crunch French toast for breakfast, and crab legs for lunch. Boiled peanuts are a real big thing down south. We purchased them at several road-side vendors and gas stations on our travels Boil raw peanuts in salted water for a couple of hours, and you have a soft and succulent snack. The boiled peanut hummus was a delicious take on this classic. As one would expect, John and I had been eating barbecue all over the deep south every chance we got, and obviously had to try some BBQ joints in the bustling food scene of Charleston. Bessinger’s has been around for ages, and the Bessinger family boasts an important hand in creating the famous mustard-based barbecue sauce, the pride and joy of South Carolina barbecue. Bessinger’s didn’t disappoint. John and I agreed that this was the best barbecue we had on our trip in the deep south (and we ate at A LOT of barbecue joints!) The meal in the picture was one meal that John and I decided to split. (With one meal served on two plates, this was a good choice.) The pulled pork was good, the ribs were nice and smoky with that pull of the bone quality we enjoy. And Bessinger’s was the first BBQ joint we ate at that didn’t overcook their brisket. YUM! FYI that ring thing is an onion donut – onion in donut batter deep fried! So this week’s recipe is very simple, something we fell in love with in the deep south. 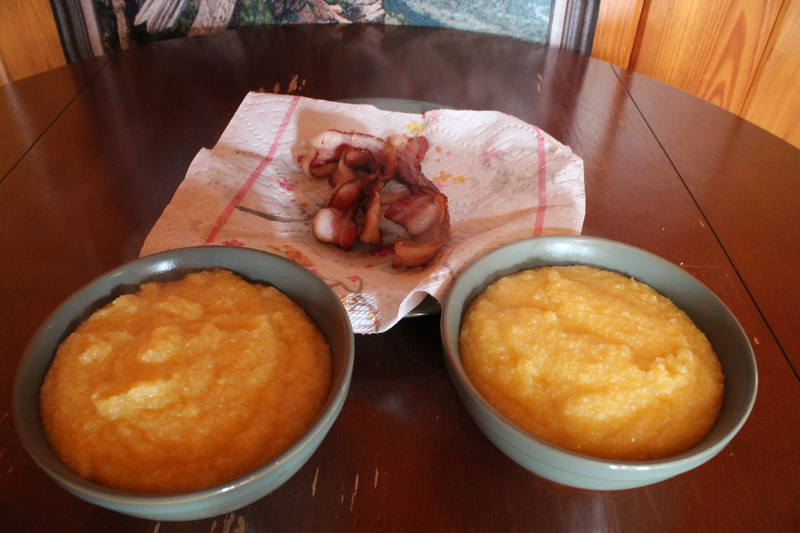 Well I guess it’s not really a recipe, but I encourage you to make yourself some grits and put your own spin on it! We’re bringing this down south classic up north for you! During our culinary tour, John and I learned all about ground stone ground corn. Grind once, you have grits, Grind twice you have polenta. Three times for corn meal and four times for corn flour. Bring your water to a boil. Add grits gradually to water, while whisking. Turn down heat and continue to whisk until grits are done. Add salt and butter to taste. Add a little milk if you desire too. Yes, grits are that simple – so you have no excuse to not try them! Grits aren’t easy to find up north, but we managed to find some at Bulk Barn, so head down there and pick some up for yourself. Although John and I prefer our grits the classic way above with just butter and salt, you can fancy them up all you like. 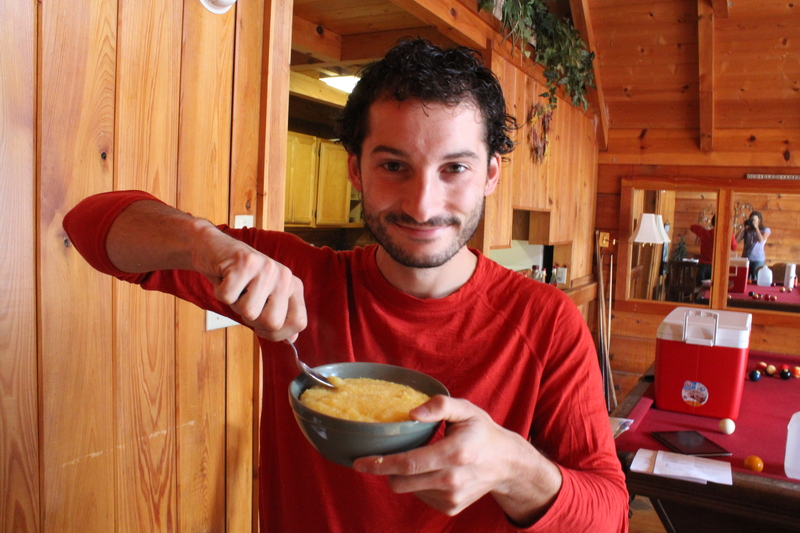 Cheesy grits was a dinner or lunch side we ordered at many restaurants down south, with cheese melted on top. You could also try the more deluxe version. Fry up any combination of onions, peppers, mushrooms, bacon, sausage and mix them in your grits! Really, just add whatever you like. I suppose this isn’t an ingredient, but a meal. John and I enjoyed these at every stop during our road trip, and they are now a staple in our kitchen! So stay tuned for the final stage of our trip next week (and possibly the most exciting recipe!) as we take you to Mississippi! Mix grated cheese, green onions and fried bacon pieces (optional) in with your grits. Makes a great side dish to any BBQ or southern dinner!